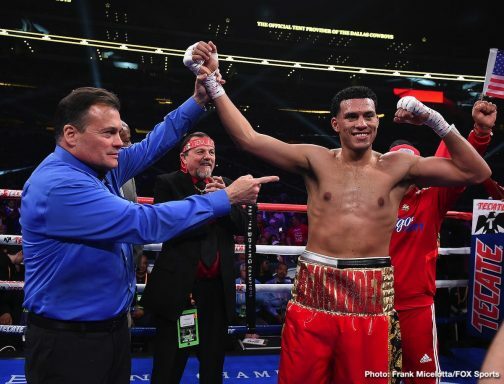 By Mike Smith: Undefeated former WBC super middleweight champion David Benavidez (21-0, 18 KOs) looked devastatingly powerful in obliterating the capable J’Leon Love (24-3-1, 13 KOs) by a second round knockout in their co-feature bout on Saturday night on PBC on Fox Sports pay-per-view at the AT&T Stadium in Arlington, Texas. In round 2, Benvidez, 22, hurt Love with a some big shots against the ropes. Referee Lawrence Cole stepped in and halted the fight. 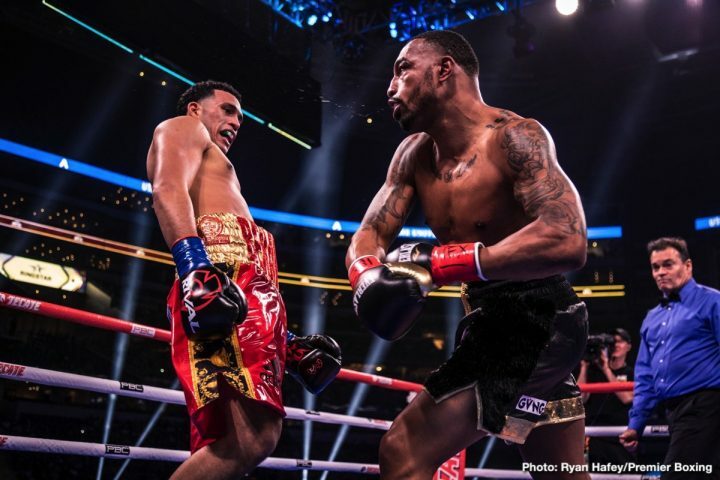 It was a quick stoppage, but Love, 31, had already been hurt in the first round, so Cole obviously didn’t want to take any chances by leaving him out there to soak up more punishment and end up getting knocked cold. The official time of the stoppage was at 1:14 of round 2. 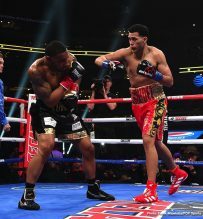 In round 1, Benavidez staggered Love with a hard left hook to the head that shook him up to his boots. Somehow, Love was able to take the shots, and fight back, but he didn’t look like he was there after getting hit. It was only a matter of time before the 6’1 1/2″ Benavidez finished him off. 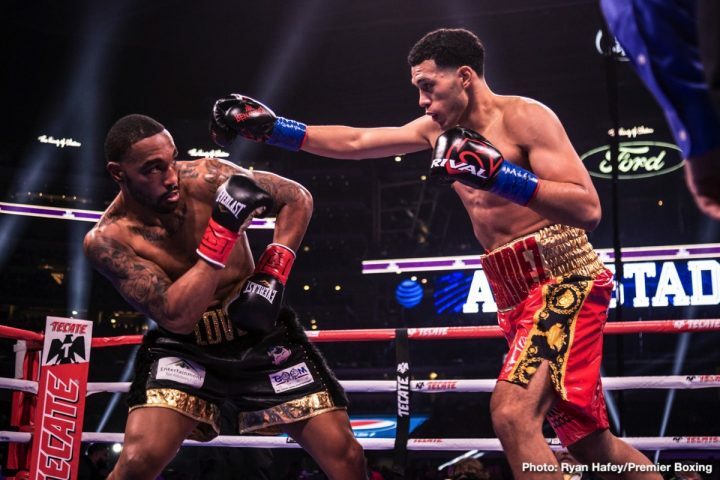 Love looked like he didn’t want to be out there tonight once Benavidez started nailing him with big shots. 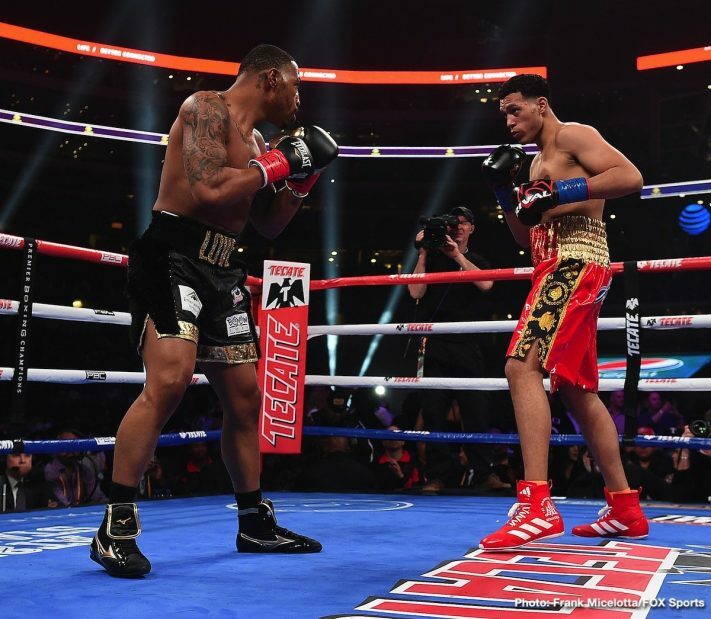 If Benavidez had pushed it, he likely could have knocked Love out in the 1st round if he had wanted to. This was a bad mismatch. One could understand why Benavidez was put in with Love, because he’d been out of the ring for a year. Benavidez needs to fight better opposition than this if he wants to build his fan base with the U.S boxing fans. 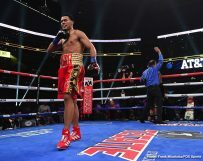 Overall, it was a good performance by former World Boxing Council 168 lb champion Benavidez, who was coming off of 13 month layoff. He had tested positive for a banned substance during a VADA test last September. Benavidez was suspended for four months, and stripped of his WBC super middleweight title. 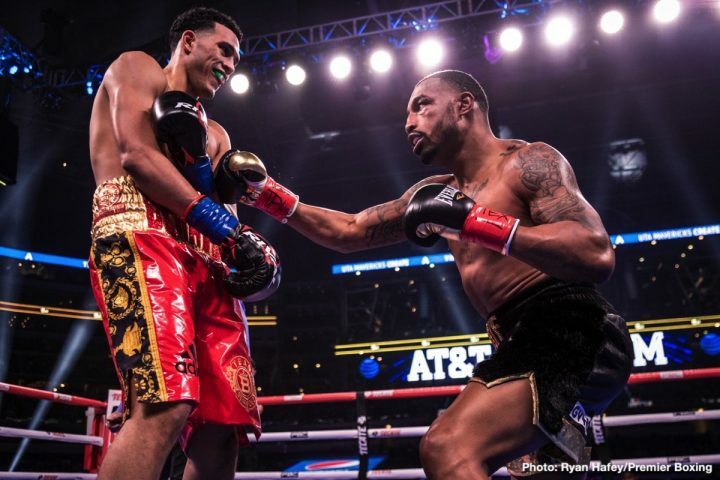 Now that he’s back, he wants to recapture his WBC title against the new champion Anthony Dirrell, and go after the other champions for unification fights. Benavidez has specifically targeted IBF champion Caleb Plant and WBA Super World belt holder Callum Smith as two guys he wants to fight. Benavidez would obviously jump at the chance to fight WBA ‘regular’ champion Saul Canelo Alvarez if he were open to fighting him. The way that Benavidez looked tonight, there might not be anyone in the division that can stand up to his ferocious punching power. This was superb performance from Benavidez. His punching power looks even better than it was a year ago. He’s getting stronger as he matures. 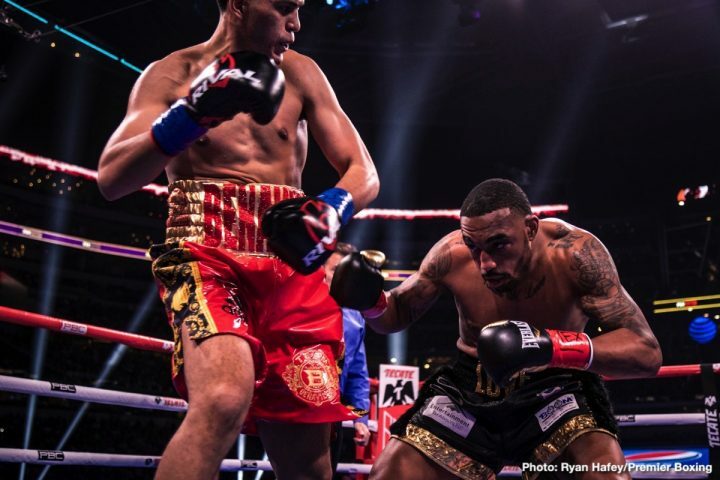 Benavidez did sparring with WBA light heavyweight champion Dimitry Bivol recently, and it obviously helped him. Benavidez looked sharper, and leaner than he had in the past. The way that Benavidez made weight for the fight tonight, he could probably drop down to middleweight if he wanted to. That would be interesting to see Benavidez fighting at middleweight against Canelo Alvarez. That might be a hard fight to put together. In time, Canelo vs. Benavidez is a match that could get made as Benavidez wins over more boxing fans. Benavidez looked like he would be a huge problem for Callum Smith and Caleb Plant. Those are the two best guys that Benavidez could face in doable fights. WBO champion Gilberto Ramirez is with Top Rank Boxing, and it’s unclear if he’s going to move up in weight to light heavyweight or not. He’s going to be fighting next month against Tommy Karpency at 175, and he choose to vacate his WBO super middleweight title. Benavidez is young, so even if he’s avoided by a lot of different fighters, he’ll eventually be involved in a lot of big fights.